Lately, I’ve become a LuLaRoe addict! 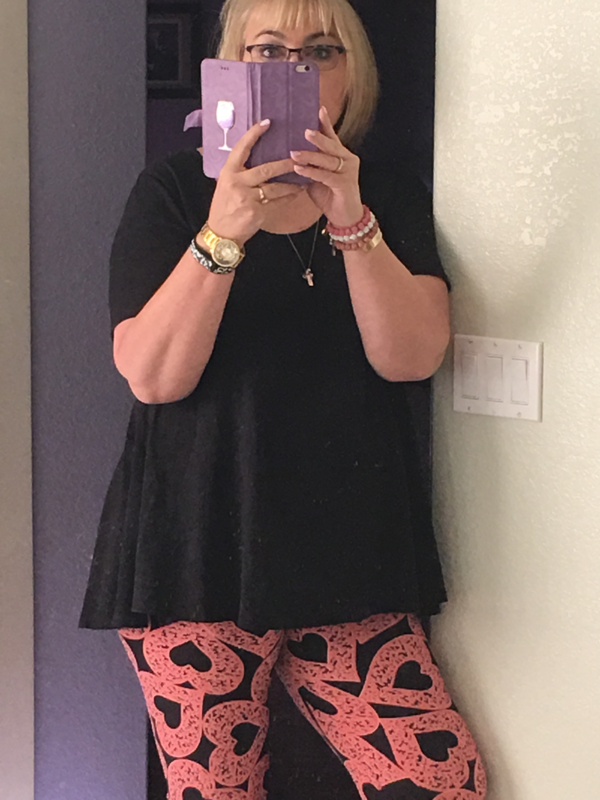 If you don’t know what LuLaRoe is, you can be adventurous and get sucked into the amazingness that is LuLaRoe or you can trust me that it is the most comfortable thing you will ever wear. They are leggings, tops, skirts, dresses, and vests that are honestly ridiculously comfortable. I’ve been wearing them for a while–on weekends–but always solid color leggings or something with a small pattern when I’m going out in public. Today I decided to wear one of my Valentine’s leggings with a long top (to cover the back end of this oversize body). As I walked into Starbucks to pick up my mobile order (LOVE that option–but off topic), two women were sitting outside. I could hear them say that someone my size should not be wearing leggings. Well, actually, I didn’t HEAR them say it–I said it for them in my head. Why do I worry so much about what other people think? My body was covered, I was comfortable, and I was fashionable. And damn it, I’m getting old, so I really don’t care what other people think. Or at least that’s what I tell myself–but obviously I do care. Is it guilt for saying those same kinds of things about other people? It could be. Is it my take on society’s body shaming people who are a different size than they are? Probably. Is it that I really didn’t look good and shouldn’t be wearing that out in public? I don’t think so. I decided that if people are comfortable in whatever they’re wearing, more power to them. If you think I shouldn’t be wearing it, or you’re uncomfortable looking at me, don’t look. But please don’t stare and feel the need to make judgments in your mind because you think I should not wear whatever it is I decide to wear. You’re not me, I’m not you, I get to make my own decisions. As long as I’m happy with myself at the moment, it’s my decision. I realize I could stand to lose some weight, I realize I could get healthier, I realize I should exercise more, I realize the change would be good, but I also realize that I’m just not entirely ready for that right now. One thing I’ve learned in my 60 years is that until I’m really mentally ready to make a change, it doesn’t matter what I think I’m attempting to do, I won’t be successful. So to the women today for whom I put words in their mouth, I’m sorry. To anyone I’ve ever mentally said anything negative about what you were wearing, I’m sorry. And to anyone I’ve actually verbally said anything negative about what you were wearing, I’m honestly and truly sorry. People are not what they are wearing–it is just decoration. While we each have a say in our decoration and it just may say a lot about who we really are, it is not another person’s task to judge that decoration. Let’s let people express themselves in any way they want to, so if I want to wear leggings in public, I will. It is so much better for my attitude to be comfortable than to be squeezed into something that might be more socially acceptable, but is uncomfortable for whatever reason. When I’m not comfortable, I’m worried more about the bulges over the top of the jeans and whether the t-shirt is covering it or accentuating it, so I’m not listening or paying as much attention to you as you deserve. That really isn’t fair to anyone. So let me be comfortable and spend some quality time with some quality people. Here is the picture of my outfit today. Like it or not–I don’t care. And that’s new for me. But today I made the choice to live my life for me and not necessarily for anyone else–and that’s a really comfortable place to be. This entry was posted in Body Shaming, People Pleasing on February 4, 2017 by Kathy. 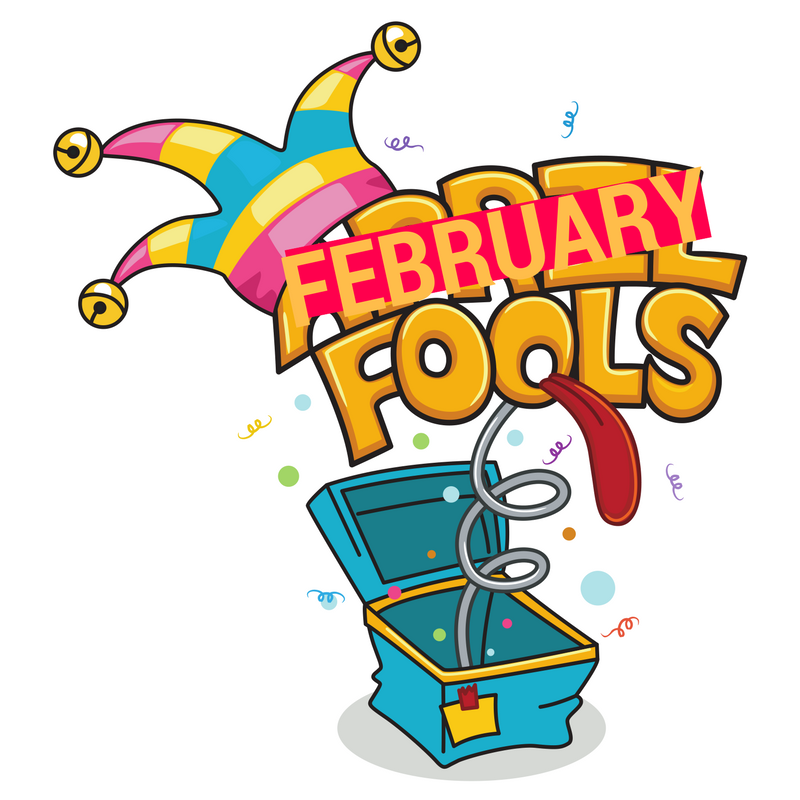 I swear yesterday was February Fool’s Day! My day started when my car started making some weird noises (yes, that’s a technical term) as I backed out of the driveway. I drove around a big block while I tried to call my husband’s cell phone–twice. He had left not long before me, so shouldn’t be too far away, BUT, he hates his flip phone (seriously! ), so he rarely answers it. I thought that perhaps when he heard it ring a couple of times in a row, he would think it was me and something was important and he would answer it. But no such luck. So I pulled back into the garage, popped the trunk, and moved a box that had some stuff rolling around in it, thinking that’s what was making the noise. I closed the trunk, got back in, and backed out of the driveway . . . to the weird noise. I drove around the big block again, trying the hubs’ cell phone another couple of times with no luck, and came back home. I popped the trunk again and took everything out of the box and put it in a bag to contain it so things weren’t rolling around. It would be quiet for sure this time! Get back in the car and back out of the driveway . . . to the weird noise . . . again. I drove around the block–just to be sure–and came back home. I tried calling again. I actually contemplated driving to the dealership since it wasn’t far away, but decided to wait for a return call. He finally called me back and said he would turn around and come home. Luckily, it was Corvette day, so he didn’t mind driving an extra 20 miles. While I was waiting for him to come home, I figured I was in the perfect mood to contact my new insurance company. Our medical coverage changed on January 1 and we still don’t have ID cards, which means I don’t have coverage for my medications. I know I could buy them and get reimbursed, but when your insurance company takes so long to process new business, my hope for getting reimbursed quickly was not good. They told me that they had just received our firm’s application on the 29th. “Of December?” I said. “No, January.” I knew that couldn’t be correct because we had SOME information–just not enough to help me. They would’t give me much information because I wasn’t HR or our broker–but they couldn’t give me any information to give to my pharmacy to fill my prescriptions. While I was not happy (and not my usual kind to others self), there wasn’t anything I could do so I said goodbye, hung up, and sent a rather “terse” email to our HR people about the issue. Our Administrator forwarded my email to our broker and I got an email right back that they would make sure something happened in the next day or two. So now I was in a super great mood (insert sarcasm here)! Hubby dearest came home and got on the ground to look under the car (after questioning me about where the sound came from–and expecting an answer like I would actually know). The next question was “did you drive over anything weird lately?” Well, probably, but it was probably dark, I was probably tired, it didn’t kill me, so I ignored it. So I said maybe, but I didn’t remember (a perk of being 60!). 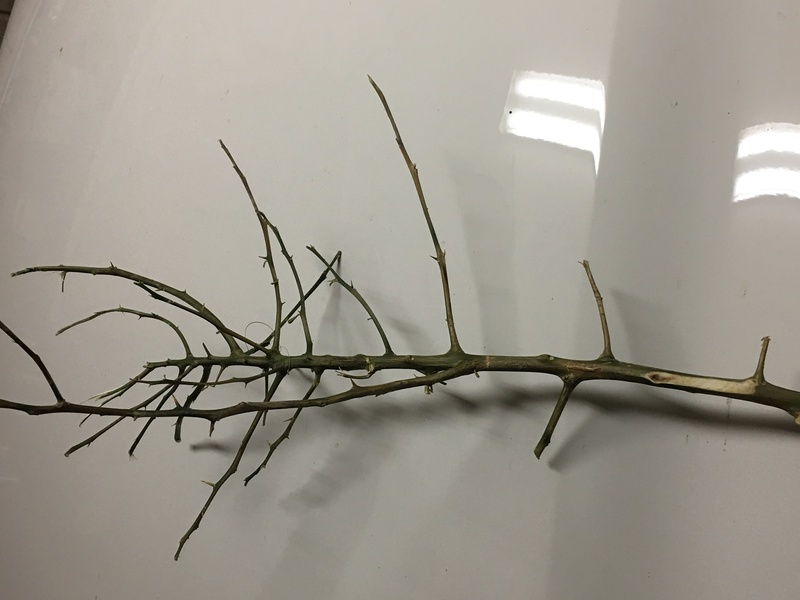 He found some clippers and proceeded to clip the branches from a palo verde tree branch that had wedged itself under my car. Thank goodness I didn’t just go to the dealer! And that was all before 9:15! So now I was late to work, but I pulled out of the driveway and started down the road and NO SOUND! It was magic! The rest of the day was pretty normal until I was driving home late. I pulled up to my street mailbox to get the mail, opened the door, pulled my mail out, and drove up to the driveway when I heard a sound on the side of my car . . . which would be the mailbox door I forgot to put back up (it only bent a little bit!). I knew it was time to get out of the car, go into the house, and go directly to bed. 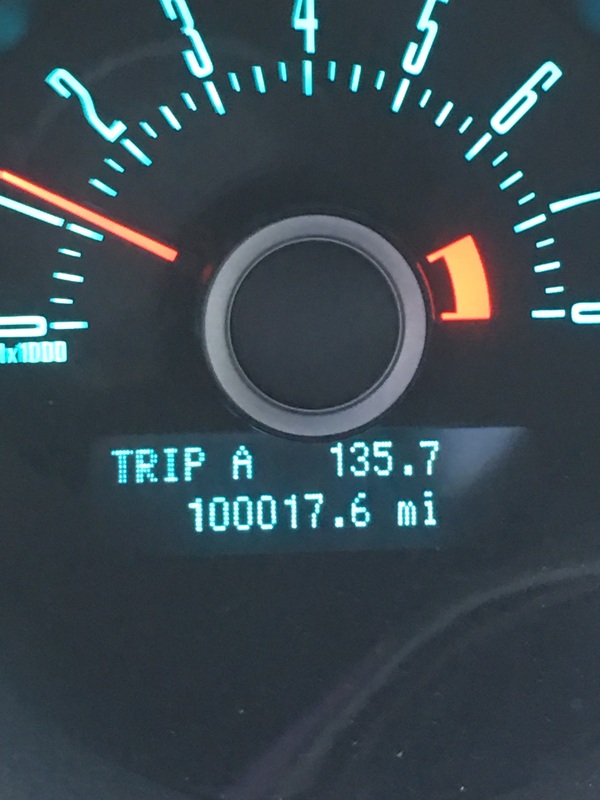 I didn’t get to do that, but when I got up and went to work today, I saw that my odometer had turned over to 100,000 miles last night. My poor car was exhausted and I was pushing all of its buttons yesterday (and all of mine!). All in all, we both made it through February Fool’s Day in one piece (and I think only one of us was the Fool). The palo verde tree branch (and my ego) wasn’t quite so lucky! This entry was posted in Uncategorized on February 3, 2017 by Kathy.